A herd of elephants is seen roaming across the Serengeti in this abstract tapestry by artist Joseph Poirier. The elephant is a prominent creature ofthe Serengeti, a region in Tanzania Africa which has the largest mammal migration in the world. Wildebeests, giraffes, buffaloes and gazelles cross the region as well as the elephants on mass. Over 2 million creatures cross the plains from the north to the south in search of water crossing the great Mara river during the spring. The African elephant is larger than the Asian elephant and they are creatures that possess great social structures and live and migrate in herds. Here we see adult elephants with some young on their journey through the plains. The use of color is cohesive with the reds, browns and green complimenting each other to create an abstract scene that celebrates the African elephant. 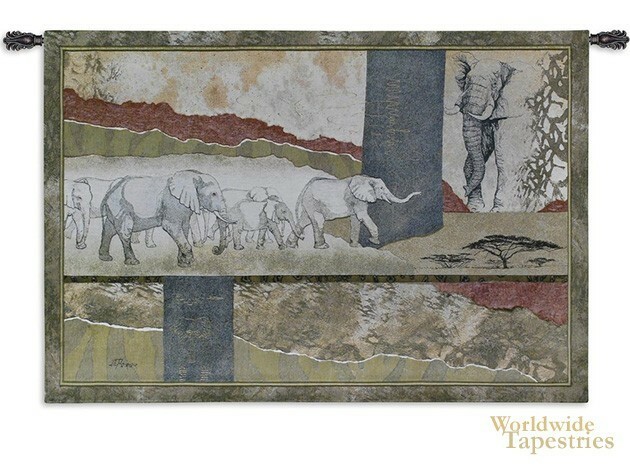 This wildlife tapestry "Serengeti Elephants" is backed with lining and tunnel for ease of hanging. Note: tapestry rod and tassels, where pictured, are purchased separately. Dimensions: W 52" x H 36"